Wace Morgan Solicitors will be merging its three offices in Shrewsbury into one base in St Mary’s Street in September. The development means the practice, which employs over 80 people, will be able to offer improved facilities and services to clients and staff. “We are very excited about our relocation plans,” said Diana Packwood, managing partner of Wace Morgan, which is the largest law firm with its head office in Shrewsbury town centre. Wace Morgan is carrying out building and adaptation work on two floors of the new offices, above Vinegar Hill and Callaghans in St Mary’s Street, in preparation for the move in mid September. 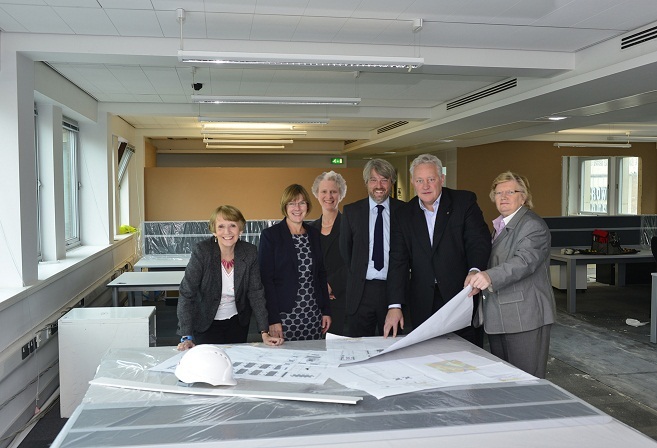 “A substantial investment is being made in the new facilities which will benefit our clients. The offices will be far more accessible, being wheelchair friendly, and will feature more meeting rooms and a much larger reception area, all leading to a vastly improved environment. “We will be opposite the bus stops and park and ride stops in St Mary’s Street and there are on-street parking places near-by, as well as parking in The Parade,” said Mrs Packwood. The new offices will also feature additional board rooms, staff areas and kitchens, bike racks and shower and the firm’s IT system is being upgraded as part of the investment programme. “Our team is very much looking forward to moving in, especially as bringing all our departments together under one roof will have huge logistical advantages for everyone. And the move will give us more scope for growth in the future,” she added. In the last few years Wace Morgan, which was established over 200 years ago, has acquired other legal practices in Newtown and Bishop’s Castle, with both expansions aimed at widening the firm’s geographical area of operation.